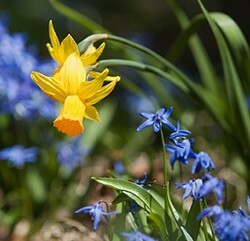 The early spring garden quickens the pulse of the winter-weary (who isn’t sick of winter by now?). If you can’t wait to get back to the garden, use this garden calendar to get started. But don’t get too impatient and start doing some jobs too soon. When the soil is soft and muddy and the lawn is sodden, you’re better off to wait until things dry up a bit. 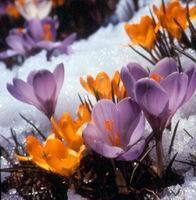 So take time to enjoy the colorful early spring bulbs – the snowdrops and crocuses. There’s a lot more color to look forward to when the season really gets going. Start winter cleanup of the lawn when the grass is no longer sopping wet and planting beds stop being a sea of mud. Rake your lawn to get rid of dead growth, stray leaves, twigs and winter debris and let light and air to the soil level, encouraging the grass to grow. Re-seed bare or damaged patches of lawn. Scratch up the soil with a rake first. Mix a shovel of soil with a couple of scoops of grass seed and spread in the patch you’re fixing. Rake level and keep well-watered until seeds germinate and the new grass establishes. Remove tree guards or burlap winter protection from any young trees or shrubs. Try not to leave tree guards in place over the summer. They keep rabbits and mice from nibbling on tender bark over the winter, but trees don’t need them in summer. They don’t allow enough air movement around the base of the trunk and that can promote rot of the bark. Apply dormant oil spray to fruit trees, magnolias, crabapples and shrubs such as euonymus to control scale insects and other overwintering pests. Use this organic pest control method when the buds are swelling but the leaves haven’t opened yet. Apply when temperatures are between 40 and 70 degrees F (4-21 degrees C). Get your lawn mower checked and blades sharpened if you didn’t get the job done in late winter. Sharp blades cut better and leave your lawn grass healthier. Don’t be in a rush to remove winter mulch or to cut back evergreen plants such as lavender until temperatures are reliably warm. Freeze and thaw cycles over the winter may given some of your plants the heave-ho. Replant any perennials that the frost has heaved out of the ground as soon as you can. Getting on top of the weeding now means a lot less work later. Weeds start growing vigorously early, so when you spot them, go to it because they are easier to pull out while their roots are still shallow in early spring. Maintain edges. Grass growth is vigorous in the early spring garden, so edge your flower beds with a sharp trench between them and the grass to keep it in bounds. Repeat this job a couple of times through the season or installing permanent edging goes a long way towards having a lower maintenance flower garden.